Everyone wants a perfect smile. Fortunately with modern dental technology, we can make that happen. 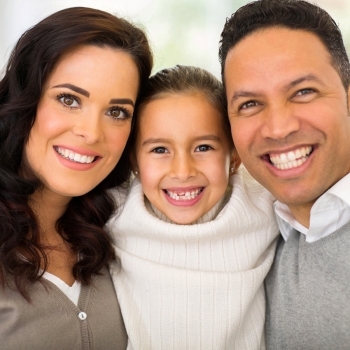 At Dental Touch Associates, we specialize in family dentistry. We’ll help you with your smile but we’ll also keep your dental health in top form. One of your first priorities in getting dental care is making sure your mouth is healthy. These can all be corrected using modern dental procedures. Cavities can be corrected with attractive, functional tooth-colored or white fillings. Gum disease can be handled by a periodontist, or it can be corrected with periodontal treatment by a general dentist, depending on the severity of the condition. Cracked teeth can be restored using a dental crown, and infected teeth can be restored using root treatment and then sealed with a dental crown. There are many options for replacing lost teeth, including dental implants, dental bridges, and removable dentures. TMJ, which relates to jaw issues, can be corrected with neuromuscular dentistry. Fortunately, these can all be corrected as well. Discolored teeth can be corrected using teeth whitening or porcelain veneers. Porcelain veneers are also a treatment option for chipped teeth and gapped teeth. So can dental bonding which is more economical. If you want to correct crooked teeth at the same time as gapped teeth, Invisalign teeth aligners might be a good option. If you’d like to learn more about your dental options, Cedar Rapids Family Dentist Dr. Blaine McLaughlin can help. He can evaluate your smile and make recommendations. For a general dental evaluation at our Cedar Rapids office, please contact Dental Touch Associates today. Receive a $25 gift card when you refer a friend! After their initial visit, we will thank you both with a $25 gift card.